CMON is developing a miniatures board game based on George R.R. Martin’s A Song of Ice & Fire series (that’s the novels, rather than the A Game of Thrones television show). To make that game, CMON is of a fashion borrowing the A Song of Ice & Fire license from Dark Sword Miniatures, which has been producing related minis for some time (in PR terms, they’ve entered a partnership). CMON, though, is working on a complete tabletop game, which the company promises will handle scenarios ranging from small skirmishes to large-scale battles with hundreds of figures. IDW Games has licensed three early video game titles from Atari: Missile Command, Asteroids, and Centipede. IDW says the line of board games will be “fun, intense and fast-paced.” The first out will be Centipede this fall. IDW is also publishing a game based on the original 1968 Planet of the Apes movie. It’ll be a cooperative adventure game in which players take on different aspects of Colonel Taylor’s personality trying to figure out the history of humanity. WizKids has renewed its Star Trek license with CBS Consumer products. And with that renewal came several new product announcements. The company is launching two new products for Star Trek: Attack Wing—Card Packs that have just new cards and tokens for existing ships, and Faction Packs that include four ships at reduced cost. 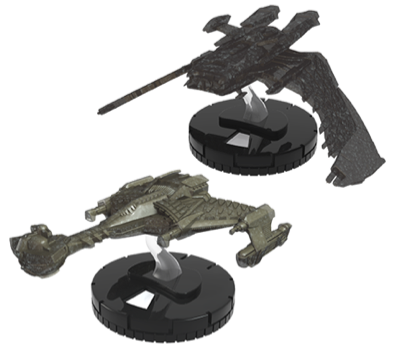 WizKids will also be offering unpainted Star Trek minis, an expansion for Star Trek: Frontiers, more Star Trek Tactics ships, and Star Trek characters for HeroClix. Fragor Games has secured a license from Aardman Animations for a Wallace & Gromit game. Cubicle 7 is releasing its licenses for the Yggdrasill, Qin, Kuro, and Keltia roleplaying games back to French publisher Le 7eme Cercle. Cubicle 7 said that the extensive work involved in translating the games prevented a reasonable economic return.